Paul Ryan is a Trump-supporting, racism-enabling coward. How Paul Ryan embraced a racist and ruined his party. 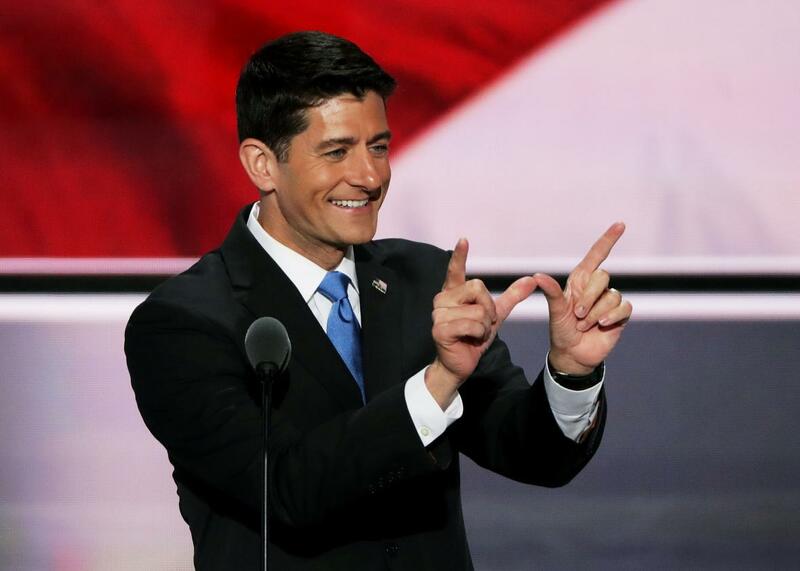 Speaker of the House Paul Ryan on the second day of the Republican National Convention on July 19, 2016 at the Quicken Loans Arena in Cleveland, Ohio. It was a remarkable sermon, delivered on behalf of the most egregious racist nominated to the presidency by a major party in at least half a century. Ryan spoke every word with his usual earnestness, unencumbered by shame. Looking back at history, we tend to focus on villains, men like Donald Trump who use hatred to gain power. We forget the importance of cowards. Every Trump needs his Ryan. But Trump’s nomination confronted Ryan with a terrible dilemma. As the head of the Republican Party, Ryan had to decide whether to reject Trump and lose the election, or embrace Trump and lose the party’s soul, as well as his own. Ryan made the wrong choice. He decided that the Republican Party would criticize race baiters, but it would also tolerate and support them. Trump has run the most racially incendiary campaign in decades. He has proposed to bar all Muslims from entering the United States. He has explicitly attacked the trustworthiness of Mexican Americans, Cuban Americans, and Seventh-day Adventists. He has libeled Arab Americans, mocked Native Americans, retweeted anti-Semites, and argued that a sportscaster shouldn’t have apologized for anti-black comments. Today, no decent, well-informed person can honestly deny Trump’s penchant for prejudice. During the primaries, Ryan condemned Trump’s Muslim ban and his failure to forcefully repudiate former Klansman David Duke. So did Mitt Romney, the former Massachusetts governor who, as the GOP’s presidential nominee, had put Ryan on the Republican ticket in 2012. But the Republican voters of 2016 flocked to Trump, and on May 3, the chairman of the Republican National Committee declared him the party’s presumptive nominee. Republican politicians had to decide: Could they support a racist demagogue for president? Third, Romney worried about Trump’s cultural effects. “I don’t want to see trickle-down racism,” said Romney. “Presidents have an impact on the nature of our nation. And trickle-down racism, trickle-down bigotry, trickle-down misogyny—all these things are extraordinarily dangerous to the heart and character of America.” Essentially, Romney was challenging his party to see prejudice in a new way—to treat it as an issue of national moral health, as Republicans have traditionally done with abortion and marriage. Initially, Ryan, too, withheld his endorsement. On May 5, two days after Trump was anointed, Ryan said he wasn’t ready to support the presumptive nominee. “This is the party of Lincoln, of Reagan, of Jack Kemp,” said Ryan. “What a lot of Republicans want to see is that we have a standard-bearer that bears our standards.” A week later, after meeting with Trump, Ryan drew a distinction between “policy disputes,” on which Republicans could agree to disagree, and “core principles,” which were non-negotiable. Trump’s attack on Curiel sparked a national uproar. Ryan couldn’t have missed it. But three days later, on June 2, he endorsed Trump. In an op-ed, Ryan said Trump had earned his blessing by affirming “fundamental principles such as the protection of life” and pledging to work with House Republicans on “the issues that make up our agenda.” Racism wasn’t on the list. Hours after the op-ed appeared, Trump went after Curiel again. He said the judge’s “Mexican heritage” created “an inherent conflict of interest” that made him unfit to judge Trump, since Trump was “building a wall” on the Mexican border. Another uproar ensued. Ryan could have withdrawn his endorsement. But he didn’t. Ryan, unlike Romney, didn’t see racism as a character issue. He treated Trump’s latest slur as a mysterious outburst. It “was out of left field, [to] my mind,” Ryan sputtered in a radio interview on June 3. “It’s reasoning I don’t relate to.” Sometimes, Ryan conceded, Trump “says and does things I don’t agree with.” But Ryan stuck with him, arguing that Trump would sign Republican bills into law. Ryan shrugged off these incidents as unhelpful but meaningless and unrelated. He blamed the Star of David incident on a “flunky” and advised Trump to “clean up the way his new media works.” In a CNN town hall on July 12, when a questioner asked about perceptions of Republican bigotry, Ryan urged voters to focus on the party’s “ideas,” not “some of the harsh rhetoric you see here or there.” To Ryan, the racism of the party’s presidential nominee was a sideshow. Ryan, like Romney, offered three arguments about race-baiting. But Ryan’s arguments weren’t for banishing it. They were for tolerating it. First, Ryan said it was unacceptable to divide the GOP. “If I lead a schism in our party, then I’m guaranteeing that a liberal progressive becomes president,” Ryan warned in a press conference on June 23. Three weeks later, at the CNN town hall, he shot down a questioner who asked about voting libertarian. That’s “basically voting for Hillary Clinton,” Ryan scoffed. Third, Ryan depicted religious bigotry as a negotiable issue and a tolerable point of view. In a June 12 interview on This Week, he emphasized that he and Trump saw eye to eye “on the big issues”: tax reform, welfare reform, and health care. When George Stephanopoulos asked about the Muslim ban, Ryan replied: “We don’t agree on that. That’s fine. Good people can disagree on things.” In the CNN town hall, Ryan again gave Trump a pass on the Muslim ban. “Look, no two people agree on everything,” he said. Ryan’s job at the convention, and for the remainder of the election, is to pretend that none of this has happened. So he ended his speech Tuesday night with a plea for love.